Overall, Manhattan rents saw a number of price fluctuations as new inventory hit the market—a 13 percent increase form 2013, the largest jumps in the Financial District and Harlem. Prices also peaked at various times throughout the year, hitting a high in the summer with prices averaging $3,728 in July, and a low in January when prices averaged $3,598. In Harlem, studio, one-bedroom and two-bedroom doorman units increased 21.68 percent, 14.01 percent and 9.12 percent, respectively, leading the greatest overall growth in the whole borough. New luxury listings at 1 Morningside Drive, 1214 Fifth Avenue, 272 Manhattan Avenue, 2270 FDB, and The Adeline pushed averages up, and a growing demand for high-end listings have only helped the case. 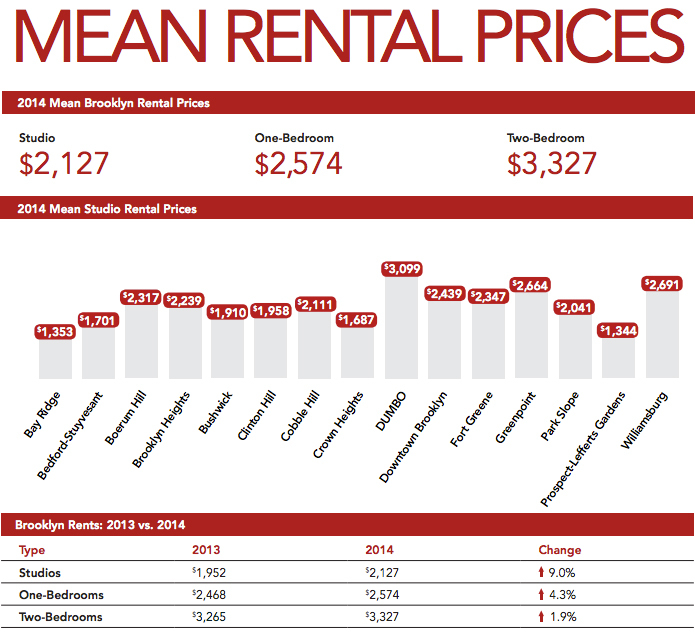 In Brooklyn, prices for studios and one-bedrooms saw big jumps of 9 percent and 4.3 percent respectively, while two-bedrooms saw a comparatively more modest growth at 1.9 percent—this led to average monthly rents of $2,127, $2,574 and $3,327 in the order mentioned. Low inventory numbers throughout the year gave way to fluctuations in prices in different areas, but overall, rents saw on average a 4.5percent jump since the previous year from $2,562 to $2,676. 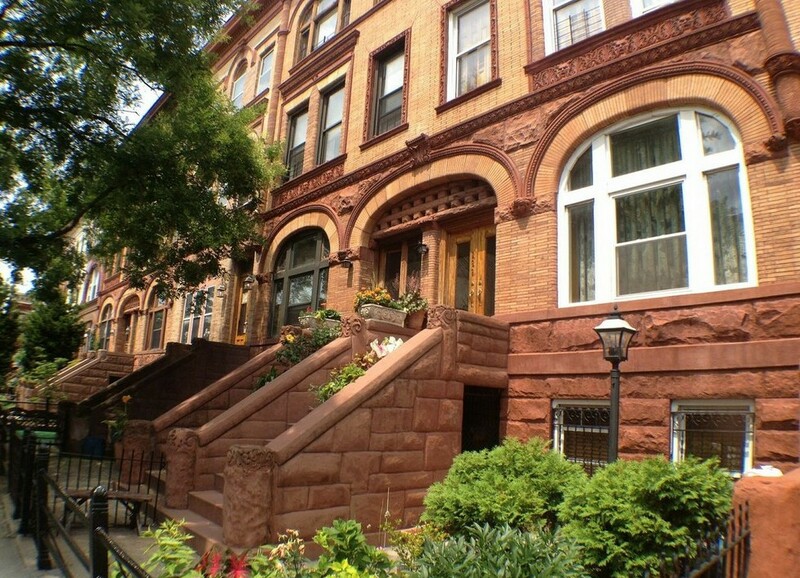 Neighborhoods with the most notable increase included Boerum Hill, Fort Greene, Crown Heights and Bedford Stuyvesant, where studios in all four neighborhoods shot up in price. With a significant number of new development buildings coming to the market over the next years, rental prices are expected to increase across Manhattan. However, the growing volume of new high-end offerings with generous amenities in Brooklyn and the Queens Waterfront (primarily Astoria and Long Island City) could lure Manhattan renters who want more bang for their buck. 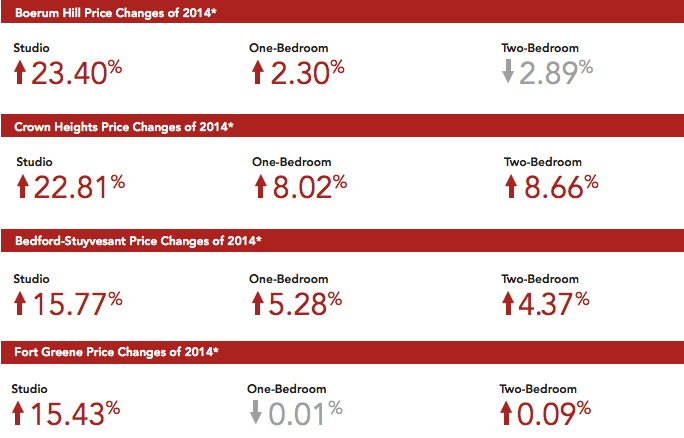 A large number of new luxury development buildings in Brooklyn with partial to full amenities coming to the market this year are expected to drive average rental prices up even further in the borough, continuing the trend we’ve seen over 2014. Notable additions to the b0rough include: a rental building at 1 North 4th Place in Williamsburg which will add 509 units to the market; a 363-unit building coming up at 461 Dean Street at The Atlantic Yards triangle where Fort Greene, Prospect Heights and Park Slope meet; and Downtown Brooklyn where the Avalon, 505 Fulton Street, 180 Myrtle Street and 81 Fleet Place will together bring another 1,300 units to the market this year alone. For more information, you can download the MNS Manhattan report here and their Brooklyn report here.